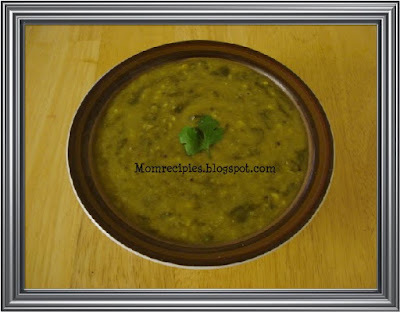 Spinach Dal is very flavorful ,tasty and healthy dal.Spinach and garlic make a great combination and makes this dal unique.This easy-to-make dish is a super health-booster, too.Traditionally it is served with hot rice, ghee and mango pickle for great satisfying meal. 1. 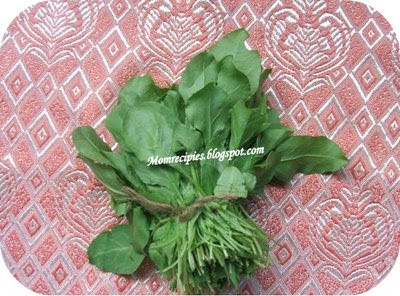 First wash and pluck the spinach leaves Then chop it . 2. Soak Lime sized tamarind in water for juice. 3. Wash and pressure cook dal with chopped spinach in 3 cups of water till 3 whistles . 4. When the pressure is released,remove the lid. 5. Mash the dal to smooth paste using wooden masher and keep it aside. 6. Heat oil in a Pan add crushed garlic cloves and saute them until golden .Take care not to burn. 7. Heat oil in pan add mustard seeds,jeera,red chillies,curry leaves ,hing and fry them . .
8. Now to mashed dal add sauted garlic ,tamarind juice / paste ,red chilli powder,turmeric,salt to taste. 9. Stir well and if the dal is too tight add half cup of water. Mix well and cook in low heat with lid covered for 5 -10 minutes. 10. Serve hot with rice,ghee and mango pickle. It can also be served with rotis and chapatis. Always always yummy to eat this Spinach dal, looks yummy. I think today it is a dal day, i have been seeing variety of dal dishes today. Looks so so yumm. This is a simple recipe and looks good. I will try this. I have to purchase dal but will try it for sure. Yum tamarind paste in your dhal! Great idea. I'll have to look up Hing then give this a try.